Despite being relatively restricted to an Atlantic sustenance, Portuguese cuisine has many Mediterranean influences. Portuguese cuisine is famous for seafood. The influence of Portugal's former colonial possessions is also notable, especially in the wide variety of spices used. These spices include piri piri (small, fiery chili peppers) and black pepper, as well as cinnamon, vanilla and saffron. Olive oil is one of the bases of Portuguese cuisine, which is used both for cooking and flavouring meals. Garlic is widely used, as are herbs, such as bay leaf and parsley. A Portuguese breakfast often consists of fresh bread, with butter, ham, cheese or jam, accompanied with coffee, milk, tea or hot chocolate. A small espresso coffee (sometimes called a bica after the spout of the coffee machine) is a very popular beverage had during breakfast, which is enjoyed at home or at the many cafés that feature in towns and cities throughout Portugal. Sweet pastries are also very popular, as well as breakfast cereal, mixed with milk or yogurt and fruit. Lunch, often lasting over an hour, is served between noon and 2 o'clock, typically around 1 o'clock and dinner is generally served around 8 o'clock. There are three main courses, with lunch and dinner usually including a soup. A common Portuguese soup is caldo verde, which is made with potato, shredded collard greens, and chunks of chouriço (a spicy Portuguese sausage). Among fish recipes, salted cod (bacalhau) dishes are pervasive. The most typical desserts are arroz doce (rice pudding decorated with cinnamon) and caramel custard. There is also a wide variety of cheeses, usually made from the milk of sheep, goats or cows. These cheeses can also contain a mixture of different kinds of milk. The most famous are queijo da serra from the region of Serra da Estrela, Queijo São Jorge from the Portuguese island of São Jorge, and Requeijão. A popular pastry is the pastel de nata, a small custard tart often sprinkled with cinnamon. Portugal is a seafaring nation with a well-developed fishing industry and this is reflected in the amount of fish and seafood eaten. The country has Europe's highest fish consumption per capita and is among the top four in the world for this indicator. Fish is served grilled, boiled (including poached and simmered), fried or deep-fried, stewed (often in clay pot cooking), roasted, or even steamed. Foremost amongst these is bacalhau (cod), which is the type of fish most consumed in Portugal. It is said that there are more than 365 ways to cook cod, one for every day of the year. Cod is almost always used dried and salted, because the Portuguese fishing tradition in the North Atlantic developed before the invention of refrigeration—therefore it needs to be soaked in water or sometimes milk before cooking. The simpler fish dishes are often flavoured with virgin olive oil and white wine vinegar. Portugal has been fishing and trading cod since the 15th century, and this cod trade accounts for its ubiquity in the cuisine. Other popular seafood includes fresh sardines (especially when grilled as sardinhas assadas), octopus, squid, cuttlefish, crabs, shrimp and prawns, lobster, spiny lobster, and many other crustaceans, such as barnacles and goose barnacles, hake, horse mackerel (scad), lamprey, sea bass, scabbard (especially in Madeira), and a great variety of other fish and shellfish, as well as molluscs, such as clams, mussels, oysters, periwinkles, and scallops. Caldeirada is a stew consisting of a variety of fish and shellfish with potatoes, tomatoes and onions. Sardines used to be preserved in brine for sale in rural areas. Later, sardine canneries developed all along the Portuguese coast. Ray fish is dried in the sun in Northern Portugal. Canned tuna is widely available in Continental Portugal. Tuna used to be plentiful in the waters of the Algarve. They were trapped in fixed nets when they passed the Portuguese southern coast to spawn in the Mediterranean, and again when they returned to the Atlantic. Portuguese writer Raul Brandão, in his book Os Pescadores, describes how the tuna was hooked from the raised net into the boats, and how the fishermen would amuse themselves riding the larger fish around the net. Fresh tuna, however, is usually eaten in Madeira and the Algarve, where tuna steaks are an important item in local cuisine. Canned sardines or tuna, served with boiled potatoes, black-eyed peas, and hard-boiled eggs, constitute a convenient meal when there is no time to prepare anything more elaborate. Eating meat and poultry on a daily basis was historically a privilege of the upper classes. Pork and beef are the most common meats in the country. Meat was a staple at the nobleman's table during the Middle Ages. A Portuguese Renaissance chronicler, Garcia de Resende, describes how an entrée at a royal banquet was composed of a whole roasted ox garnished with a circle of chickens. A common Portuguese dish, mainly eaten in winter, is cozido à portuguesa, which somewhat parallels the French pot au feu or the New England boiled dinner. Its composition depends on the cook's imagination and budget. An extensive lavish cozido may include beef, pork, salt pork, several types of enchidos (such as cured chouriço, morcela e chouriço de sangue, linguiça, farinheira, etc. ), pig's feet, cured ham, potatoes, carrots, turnips, chickpeas, cabbage and rice. This would originally have been a favourite food of the affluent farmer, which later reached the tables of the urban bourgeoisie and typical restaurants. Tripas à moda do Porto (tripe with white beans) is said to have originated in the 14th century, when the Castilians laid siege to Lisbon and blockaded the Tagus entrance. The Portuguese chronicler Fernão Lopes dramatically recounts how starvation spread all over the city. Food prices rose astronomically, and small boys would go to the former wheat market place in search of a few grains on the ground, which they would eagerly put in their mouths when found. Old and sick people, as well as prostitutes, or in short anybody who would not be able to aid in the city's defence, were sent out to the Castilian camp, only to be returned to Lisbon by the invaders. It was at this point that the citizens of Porto decided to organize a supply fleet that managed to slip through the river blockade. Apparently, since all available meat was sent to the capital for a while, Porto residents were limited to tripe and other organs. Others claim that it was only in 1415 that Porto deprived itself of meat to supply the expedition that conquered the city of Ceuta, in North Africa. Whatever the truth may be, since at least the 17th century, people from Porto have been known as tripeiros or tripe eaters. Another Portuguese dish with tripe is Dobrada. Nowadays, the Porto region is equally known for the toasted sandwich known as a francesinha (little French). In Alto Alentejo (North Alentejo), there is a very typical dish made with lungs, blood and liver, of either pork or lamb. This traditional Easter dish is eaten at other times of year as well. Many other meat dishes feature in Portuguese cuisine. In the Bairrada area, a famous dish is Leitão à Bairrada (roasted suckling pig). Nearby, another dish, chanfana (goat slowly cooked in wine) is claimed by two towns, Miranda do Corvo ("Capital da Chanfana") and Vila Nova de Poiares ("Capital Universal da Chanfana").Carne de porco à alentejana, fried pork with clams, is a popular dish with a misleading name as it originated in the Algarve, not in Alentejo. Alcatra, beef marinated in red wine and garlic, then roasted, is a tradition of Terceira Island in the Azores. Alentejo is a vast agricultural province with only one sizeable fishing port, Sines; and in the past, shellfish would not have been available in the inland areas. On the other hand, all points in the Algarve are relatively close to the coast and pigs used to be fed with fish, so clams were added to the fried pork to disguise the fishy taste of the meat. Nowadays, however, nobody would dream of calling it carne de porco à Algarvia. Legend also says that the dish was developed to test Jewish converts' new Christian faith; consisting of pork and shellfish (two non-kosher items), Marranos were expected to eat the dish in public in order to prove their complete detachment from the Jewish faith. The Portuguese steak, bife, is a slice of fried beef or pork served in a wine-based sauce with fried potatoes, rice, or salad. To add a few more calories to this dish, an egg, sunny-side up, may be placed on top of the meat, in which case the dish acquires a new name, bife (com um ovo) a cavalo (steak with an egg on horseback). This dish is sometimes referred to as bitoque, to demonstrate the idea that the meat only "touches" the grill twice, meaning that it does not grill for too long before being served, resulting in a rare to medium-rare cut of meat. Another variation of bife is bife a casa (house steak), which may resemble the bife a cavalo or may feature embellishments, such as asparagus. Iscas (fried liver) were a favourite request in old Lisbon taverns. Sometimes, they were called iscas com elas, the elas referring to sautéed potatoes. Small beef or pork steaks in a roll (pregos or bifanas, respectively) are popular snacks, often served at beer halls with a large mug of beer. In modern days, however, when time and economy demand their toll, a prego or bifana, eaten at a snack bar counter, may constitute the lunch of a white collar worker. Espetada (meat on a skewer) is very popular in Madeira. Alheira, a yellowish sausage from Trás-os-Montes, served with fried potatoes and a fried egg, has an interesting story. In the late 15th century, King Manuel of Portugal ordered all resident Jews to convert to Christianity or leave the country. The King did not really want to expel the Jews, who constituted the economic and professional élite of the kingdom, but was forced to do so by outside pressures. So, when the deadline arrived, he announced that no ships were available for those who refused conversion—the vast majority—and had men, women and children dragged to churches for a forced mass baptism. Others were even baptized near the ships themselves, which gave birth to a concept popular at the time: baptizados em pé, literally meaning: "baptized while standing". Obviously, most Jews maintained their religion secretly, but tried to show an image of being good Christians. Since avoiding pork was a tell-tale practice in the eyes of the Inquisition, converts devised a type of sausage that would give the appearance of being made with pork, but really only contained heavily spiced game and chicken. Nowadays, however, tradition has been broken, and pork has been added to the alheiras. Poultry, easily raised around a peasant's home, was at first considered quality food. Turkeys were only eaten for Christmas or on special occasions, such as wedding receptions or banquets. Up until the 1930s, the farmers from the outskirts of Lisbon would come around Christmas time to bring herds of turkeys to the city streets for sale. Before being killed, a stiff dose of brandy was forced down the birds' throats to make the meat more tender and tasty, and hopefully to ensure a happy state of mind when the time would come for the use of a sharp knife. Poor people ate chicken almost only when they were sick. Nowadays, mass production in poultry farms makes these meats accessible to all classes. Thus bifes de Peru, turkey steaks, have become an addition to Portuguese tables. Vegetables that are popular in Portuguese cookery include tomatoes, cabbage, and onions. There are many starchy dishes, such as feijoada, a rich bean stew with beef and pork, and açorda, a thick bread-based casserole generally flavoured with garlic, parsley, and coriander or seafood. Many dishes are served with salads usually made from tomato, lettuce, and onion flavoured with olive oil and vinegar. Potatoes and rice are also extremely common in Portuguese cuisine. 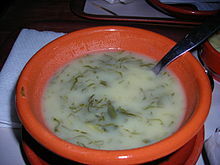 Soups made from a variety of vegetables are commonly available, one of the most popular being caldo verde, made from potato purée, thinly sliced kale, and slices of chouriço. There are a wide variety of Portuguese cheeses, made from cow's, goat's or sheep's milk. Usually these are very strongly flavoured and fragrant. Traditional Portuguese cuisine does not include cheese in its recipes, so it is usually eaten on its own before or after the main dishes. In the Azores, there is a type of cheese made from cow's milk with a spicy taste, the Queijo São Jorge. Other well known cheeses with protected designation of origin, such as Queijo de Azeitão, Queijo de Castelo Branco and the Queijo da Serra da Estrela, which is very strong in flavour, can be eaten soft or more matured. Serra da Estrela is handmade from fresh sheep's milk and thistle-derived rennet. The Queijo mestiço de Tolosa, is the only Portuguese cheese with protected geographical indication and it is made in the civil parish of Tolosa, in the small village of Nisa, Portalegre District, Alto Alentejo. In the Nisa area, Queijo de Nisa is the local variation. Wine (red, white and "green") is the traditional Portuguese drink, the Rosé variety being popular in non-Portuguese markets and not particularly common in Portugal itself. Vinho Verde, termed "green" wine, is a specific kind of wine which can be red, white or rosé, and is only produced in the northwestern (Minho province) and does not refer to the colour of the drink, but to the fact that this wine needs to be drunk "young". A "green wine" should be consumed as a new wine while a "maduro" wine usually can be consumed after a period of ageing. Green wines are usually slightly sparkling. 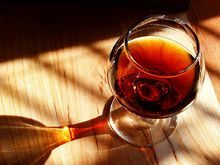 Port wine is a fortified wine of distinct flavour produced in Douro, which is normally served with desserts. Vinho da Madeira, is a regional wine produced in Madeira, similar to sherry. From the distillation of grape wastes from wine production, this is then turned into a variety of brandies (called aguardente, literally "burning water"), which are very strong tasting. Typical liqueurs, such as Licor Beirão and Ginjinha, are very popular alcoholic beverages in Portugal. In the south, particularly the Algarve, a distilled spirit called medronho, which is made from the fruit of the Strawberry tree. Many of the country's typical pastries were created in the Middle Ages monasteries by nuns and monks and sold as a means of supplementing their incomes. The main ingredient for these pastries was egg yolks. It is a common belief that the medieval nuns used vast quantities of egg whites to stiffen their habits, and developed endless dessert recipes to use all the surplus yolks. However, it is also known that Portugal was a major egg producer, mainly between the 18th and 19th centuries, and that most of the egg whites were exported to be used as a purifier in white wine production or to iron suits. The excess quantity of yolks, combined with plenty of sugar coming from the Portuguese colonies, was the inspiration for the creation of recipes made from egg yolk. The names of these desserts are usually related to monastic life and to the Catholic faith. Examples are, among others, barriga de freira (nun's belly), papos de anjo (angel's chests), and toucinho do céu (bacon from heaven). Other common ingredients in Portuguese convent confectionery are almonds, doce de chila/gila (made from squash), wafer paper, and candied egg threads called fios de ovos. Rich egg-based desserts are very popular in Portugal and are often seasoned with spices, such as cinnamon and vanilla. The most popular are leite-creme (a dessert consisting of an egg custard-base topped with a layer of hard caramel), arroz doce (a typical and popular rice pudding), and pudim flã. Cakes and pastries are also very popular in Portugal. Most towns have a local specialty, usually egg or cream-based pastry. Originally from Lisbon, but popular nationwide, as well as among the diaspora, are pastéis de nata. These are small, extremely rich custard tarts. Other very popular pastries found in most cafés, bakeries and pastry shops across the country are the Bola de Berlim, the Pão-de-ló, the Bolo de arroz, and the Tentúgal pastries. Portugal formerly had a large empire and the cuisine has been influenced in both directions. Portuguese influences are strongly evident in Brazilian cuisine, which features its own versions of Portuguese dishes, such as feijoada and caldeirada (fish stew). Other Portuguese influences can be tasted in the Chinese territory of Macau (Macanese cuisine) and in the Indian province of Goa, where Goan dishes, such as vindalho (a spicy curry), show the pairing of vinegar and garlic. The Persian orange, grown widely in southern Europe since the 11th century, was bitter. Sweet oranges were brought from India to Europe in the 15th century by Portuguese traders. Some Southeast Indo-European languages name the orange after Portugal, which was formerly its main source of imports. Examples are Albanian portokall, Bulgarian portokal [портокал], Greek portokali [πορτοκάλι], Persian porteghal [پرتقال], and Romanian portocală. In South Italian dialects (Neapolitan), the orange is named portogallo or purtualle, literally "the Portuguese ones". Related names can also be found in other languages: Turkish Portakal, Arabic al-burtuqal [البرتقال], Amharic birtukan [ቢርቱካን], and Georgian phortokhali [ფორთოხალი]. The Portuguese imported spices, such as cinnamon, now liberally used in its traditional desserts, from Asia. Furthermore, the Portuguese "canja", a chicken soup made with rice, is a popular food therapy for the sick, which shares similarities with the Asian congee, used in the same way, suggesting it may have come from the East. Tea was made fashionable in Britain in the 1660s after the marriage of King Charles II to the Portuguese princess Catherine of Braganza, who brought her liking for tea, originally from the colony of Macau, to the court. In 1543, Portuguese trade ships reached Japan and introduced refined sugar, valued there as a luxury good. Japanese lords enjoyed Portuguese confectionery so much it was remodelled in the now traditional Japanese konpeitō (candy), kasutera (sponge cake), and keiran somen (the Japanese version of Portuguese "fios de ovos"; this dish is also popular in Thai cuisine under the name "kanom foy tong"), creating the Nanban-gashi, or "New-Style Wagashi". During this Nanban trade period, tempura was introduced to Japan by early Portuguese missionaries. All over the world, Portuguese immigrants influenced the cuisine of their new "homelands", such as Hawaii and parts of New England. Pão doce (Portuguese sweet bread), malasadas, sopa de feijão (bean soup), and Portuguese sausages (such as linguiça and chouriço) are eaten regularly in the Hawaiian islands by families of all ethnicities. Similarly, the "papo seco" is a Portuguese bread roll with an open texture, which has become a staple of cafés in Jersey, where there is a substantial Portuguese community. In Australia, variants of "Portuguese-style" chicken, sold principally in fast food outlets, has become extremely popular in the last two decades. Offerings include conventional chicken dishes and a variety of chicken and beef burgers. In some cases, such as "Portuguese chicken sandwiches", the dishes offered bear only a loose connection to Portuguese cuisine, usually only the use of "Piri-piri sauce" (a Portuguese sauce made with piri piri, which are small, fiery chili peppers), and the connection is made simply as a marketing technique. 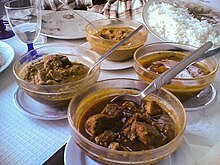 The Portuguese had a major influence on African cuisine. They are responsible for introducing corn in the African continent. The 18th century was the "golden age" for Madeira. The wine's popularity extended from the American colonies and Brazil in the New World to Great Britain, Russia, and Northern Africa. The American colonies, in particular, were enthusiastic customers, consuming as much as a quarter of all wine produced on the island each year. Madeira was an important wine in the history of the United States of America. No wine-quality grapes could be grown among the 13 colonies, so imports were needed, with a great focus on Madeira. One of the major events on the road to revolution in which Madeira played a key role was the British seizure of John Hancock’s sloop the Liberty on May 9, 1768. Hancock's boat was seized after he had unloaded a cargo of 25 casks (3,150 gallons) of Madeira, and a dispute arose over import duties. The seizure of the Liberty caused riots to erupt among the people of Boston. Madeira was a favorite of Thomas Jefferson, and it was used to toast the Declaration of Independence. George Washington, Alexander Hamilton, Benjamin Franklin, and John Adams are also said to have appreciated the qualities of Madeira. The wine was mentioned in Benjamin Franklin's autobiography. On one occasion, Adams wrote to his wife, Abigail, of the great quantities of Madeira he consumed while a Massachusetts delegate to the Continental Congress. A bottle of Madeira was used by visiting Captain James Server to christen the USS Constitution in 1797. Chief Justice John Marshall was also known to appreciate Madeira, as did his fellow justices on the early U.S. Supreme Court. Wikimedia Commons has media related to Cuisine of Portugal. Wikimedia Commons has media related to Desserts of Portugal. ^ "Portuguese food". baidu. Retrieved 10 October 2015. ^ (in Portuguese) PESSOA, M.F. ; MENDES, B.; OLIVEIRA, J.S. CULTURAS MARINHAS EM PORTUGAL Archived 2008-10-29 at the Wayback Machine, "O consumo médio anual em produtos do mar pela população portuguesa, estima-se em cerca de 58,5 kg/ por habitante sendo, por isso, o maior consumidor em produtos marinhos da Europa e um dos quatro países a nível mundial com uma dieta à base de produtos do mar." ^ Administrator. "Mas afinal...o que é a Chanfana?". www.bikeonelas.com. ^ "Vila Nova de Poiares: Capital Universal da Chanfana". ^ "Bife a Casa (Portuguese House Steak)". Kidbite Lunches. 16 October 2012. ^ "Gloria's Restaurant Menu". Gloria's Portuguese Restaurant. ^ "The Prettiest Pastries of Portugal, and How to Recognize Them". Vogue. Archived from the original on 2018-11-07. Retrieved 2018-11-07.